This year’s Commission on the Status of Women (CSW) is focused on ‘the empowerment of rural women and girls’. 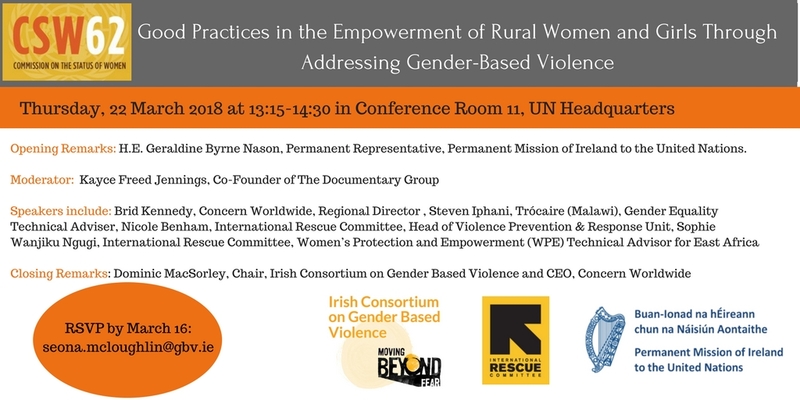 It is the first time Ireland has chaired the Commission and it presents an opportunity not only to help forge a more ambitious plan of action to support the empowerment of women and girls in rural contexts, but to do so with knowledge gained from a very broad range of experience in this area. The Consortium believes that understanding the relationship between addressing GBV and the empowerment of rural women and girls must be central to the outcomes of this year’s CSW session and consortium members’ experience of programming in rural areas provides crucial insight and learning in this area. The Consortium worked with Dr. Aising Swaine, Assistant Professor of Gender and Security at the Department of Gender Studies on the development of a policy brief which explores these issues GBV in relation to rural women and girls overall inequality. 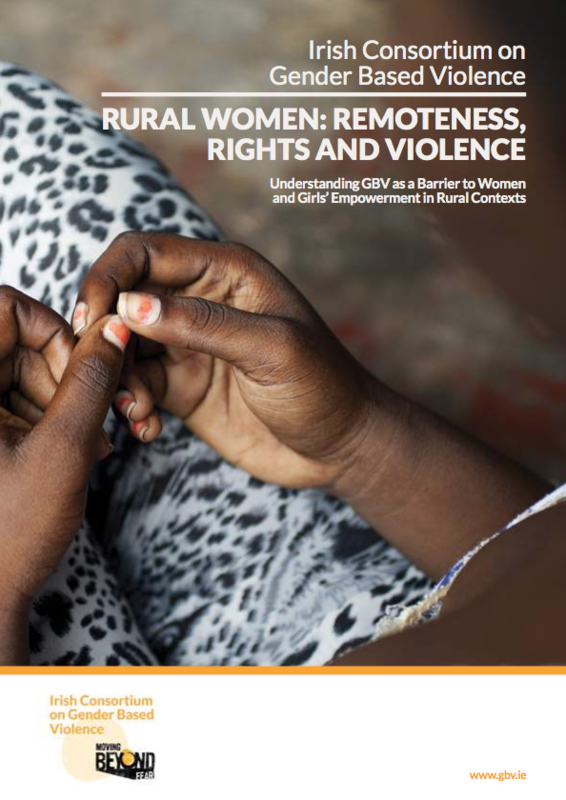 The policy brief describes key approaches and learning for addressing GBV through empowerment programming in rural areas, through examples from the work of members of the ICGBV. It shows that the theme of this year’s CSW is fitting and timely as the rural context often puts women and girls at an increased risk of GBV. Gorta Self Help Africa (GSHA) appreciates that GBV in deeply rooted in structural relationships of inequality and the power imbalance that exists between men and women, boys and girls. As such, GSHA strives to reduce GBV in their programming with small holder farmers by fostering activities that promote family discussion and mutual understanding of issues such as gender roles and responsibilities, unequal relationships and workloads. GSHA have adopted the Family Life Model (FLM) as an approach to help counteract gender inequality. This is a localised and integrated approach that articulates the relationship between the family aspirations and the necessary resources to meet them. The FLM aims to encourage the family to be an agent of change and transformation in the community and society by challenging traditional notions of gender roles and responsibilities. It strives to ensure that the family makes decisions together, sharing resources and their benefits fairly. GSHA’s research has shown that this model helps to ensure greater family harmony and peace in the household between all of its members, creating an environment where decisions are made jointly and there is more equal control over available resources, often leading to a reduction in GBV.63 Prevention is GSHA’s core area of concern as they strive to reduce physical, sexual, psychological and economic GBV recognising that every person should have the right to be free from physical, emotional and psychological harm. Against this backdrop, GOAL has begun expanding its programme in the Diffa region of Southern Niger, where an estimated 240,000 displaced people have fled over the border from Northern Nigeria. In February 2016 GOAL began the distribution of emergency kits to vulnerable persons in Diffa region, including those who have been affected by the conflict in Northern Nigeria. The kits contain basic essential items- soap, jerry cans, blankets, and mosquito nets – but for some beneficiaries it was the first time they had access to anything like this since they had been uprooted by the conflict. GOAL complimented this distribution work by working with the local health system. In an effort to strengthen a system that had been stretched to cope with the arrival of vulnerable families, GOAL supported the District Health Office with two additional nurses to provide primary healthcare and midwifery services in the Diffa region, and also provided 2 additional staff for Expanded Programme on Immunisation outreach activities. The training provided by the programme and the secondment of nurses in the region helped minimise the potential shock to the health system from the increased demand on services from the high influx of refugees and IDPs. Increased reach of the Government of Niger’s cold chain supply for an estimated additional population of 8,000 IDPs and refugees who have settled in the health facility catchment area. The GOAL programme is an example of one that is designed to meet the basic needs of those that have been displaced by conflict, focussing on the most vulnerable. Women’s reproductive health needs are particularly acute in this region right now and the intervention is targeted to support government efforts to meet these needs. Falmata is a 34-year old mother, originally from Northern Nigeria. Last year the conflict forced her and her daughter to flee from their home village of Chétimari town on North East Nigeria, finding refuge in the small village of Koublé, in the Diffa region of Niger. Her daughter recalled how one day, she came home from working on the farm to find houses in the village burnt down by Boko Haram. Although their house still stood, Falmata did not feel safe to stay. She also had no information on the whereabouts of her husband. She looked around her home thinking about what she could take, as she could take only what she could carry. After some time, she got news that her husband had been killed by members of Boko Haram. The family now live in a small makeshift house in Koublé, and survive on less than 1 USD a day and help from the humanitarian actors. The kit that she received contains basic items that are essential for her and her family. The Defence Forces (DF) are fully committed to the principles and practice of UNSCR 1325, the Women, Peace and Security agenda, and the UN Secretary General’s Zero Tolerance on Sexual Exploitation and Abuse Bulletin (October 2003). The steps taken by the Defence Forces to include a gender perspective are comprehensive. The Defence Forces employ a Gender Advisor in its Headquarters who is responsible for the overall education and implementation of a gender perspective in all military training and operations. Gender Advisors are also located in each Brigade and Formation and are responsible for overseeing that a gender perspective is implemented within their area of operations. All induction and career courses include a Gender Perspective Brief which includes material on gender equality, UNSCR 1325, Gender-Based Violence and Sexual Exploitation and Abuse (SEA). Mandatory pre-deployment training features lessons on SEA which includes a UN video ‘To Serve with Pride’, and standards of behavior on UN, NATO and EU missions. Troops are provided with a Tac Aide Memoir on Codes of Conduct for Blue Helmets and a DF Code of Conduct. Pre-deployment training culminates in a ten day Mission-Readiness Exercise in which GBV scenario based training is incorporated. The training and education delivered by United Nations Training School Ireland (UNTSI) includes: Gender-Based Violence, Conflict Related Sexual Violence, the Implementation of a Gender Perspective into the Operational Planning Processes, and establishing specific gender-related functions for troops on the ground, such as training gender focal points (GFPs) prior to overseas deployment. Adopting a gender perspective is no longer an optional add-on for the military commander, it is now an operational imperative. Security assessments, plans and analysis must include thorough considerations of women’s contributions to community resilience, sustainable peace, and local security. The framework of UNSCR 1325, a central pillar of which is ‘Protection, Relief and Recovery’, provides a policy background and helpful starting position for this approach. Women and girls, their needs, their participation, their experiences, their strengths and their voices are key to achieving sustainable and durable peace in countries ravaged by conflict and war. At all stages of the planning process and operations a gender perspective in peacekeeping is vital if interventions are to be relevant, effective and responsive to the needs of women and girls, boys and men. Adopted in 2000, UNSCR 1325 recognises the adverse disproportionate impact of conflict on women and girls, as well as their role in conflict prevention, peace negotiations, peacebuilding and governance. Consider the special needs of women in girls in designing and administering refugee camps. The resolution has since become an organising framework for UN organisations and Peacekeepers, nation states and NGOS around the women, peace and security agenda, which focuses on advancing the components of resolution 1325. As of May 2016, 60 nations have created a National Action Plan on implementing UNSCR 1325.
are also given a brief to disseminate to the entire crew on the zero tolerance policy with regards to Sexual Exploitation and Abuse employed by the Defence Forces. The ship capacity must also take into account family units, wash facilities, sanitary needs and cultural/religious norms. GBV prevention and response efforts: from policy to action at the local level. Preventing and responding to GBV is a core priority of the Irish Aid programme, and is at the centre of its work to promote gender equality and women’s empowerment. Ireland’s policy on international development, ‘One World, One Future’ (2013), recognises that GBV is a major abuse of human rights which undermines victims’ health, well-being and livelihoods. Ireland’s Humanitarian Assistance Policy (2015) reiterates Ireland’s commitment to addressing GBV and recognises the particular vulnerabilities and needs of women and girls in emergencies, noting that attention to gender must be an essential part of every humanitarian operation. Ireland is committed to continuing to play an active role in research, policy development and funding to address GBV. Irish Aid works closely with civil society organisations and governments on GBV issues in many of our key partner countries. At a global level, Ireland supports the UN Women-administered Trust Fund to End Violence Against Women. The Government of Ireland engages in international advocacy to raise awareness on gender equality and the importance of protecting women and children in emergencies. For example, Ireland is a member of the Call to Action and the Department of Foreign Affairs and Trade plays a lead co-ordination role in the implementation of Ireland’s Second National Action Plan on Women, Peace and Security. 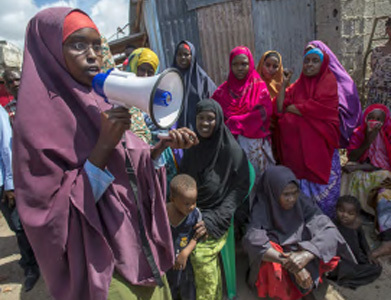 One important piece of work in recent years has been the effort by humanitarian actors to challenge the myth that GBV is an unavoidable part of conflict, thereby ensuring that efforts to tackle it are put in place. Important learnings from our partnership with the International Rescue Committee have fed into flagship advocacy reports such as “Are we there yet?” This paper has been used in key international fora, including at a 2015 EU Council working party on Humanitarian Aid and Food Aid (COHAFA) meeting. The paper helped to advise Member States on the importance of preventing and responding to GBV in emergencies; and in advocacy efforts to engage EU countries to join the Call to Action. The Government of Ireland played a prominent role in ensuring the views of Irish humanitarian stakeholders were considered in the World Humanitarian Summit, advocating for the inclusion of women and girls as a standalone outcome. Other aspects of Irish Aid’s efforts in this area focus on targeted funding for NGO programming on GBV in emergencies and deployments of specialised gender and protection capacity – through Ireland’s Rapid Response Corps, Gender Standby Capacity Project and Protection Standby Capacity Project. We work with a range of government and civil society partners at community, national and international level to tackle both the causes and the effects of GBV, and to ensure that policies are in place and are implemented. Our work aims to build awareness of the rights of women and expand women’s engagement in the economic, social and political spheres. It also seeks to engage men and boys on gender related issues. We also support organisations that help survivors of GBV. For example, we provide funding directly to the members of the Irish Consortium on Gender-Based Violence who operate GBV related programmes in over 45 countries, as well as supporting response and prevention work through our strategic multi-annual partnership with the International Rescue Committee. Irish Aid, through its partnership with NGOs, supports community-based approaches, where women and girls play a key role in the design of GBV interventions, while at the same time building the skills, knowledge and capacity of local actors and early responders in GBV preparedness and response techniques. Such work includes community- led advocacy work, awareness raising and identification of community safeguards to increase safety and security for women and girls. Response activities, for example those implemented by the International Rescue Committee, ensure the establishment of GBV survivor-centred services within the community. These services include identification of safe spaces for survivors and mapping of referral pathways and protection services so survivors are informed on the best course of action available to them. It also includes training of health professionals so they can correctly respond to the needs of GBV survivors, and the provision of case management and psychosocial support services to help survivors with their overall wellbeing. Oxfam supports a rights-based approach to gender justice that involves addressing the consequences, and also the causes, of gender inequality and GBV. This is done by very deliberately putting women’s rights at the heart of all activities. In practice, this means promoting widespread changes in attitudes and beliefs about gender power relations. In Uganda, Oxfam works with South Sudanese refugees to promote protection of communities in displaced settings by supporting the establishment of Community Protection Committees. These committees, comprised of equal numbers of men and women from both displaced and host communities, are trained on basic human rights, supported to identify protection issues in their communities, and develop plans to address these issues. These plans may include acting as mediators in a local dispute, making a referral to a specialist service provider (e.g. medical/psychosocial support in the event of sexual violence, or advocating with local authorities or NGOs for support to their right to protection). Each Committee has a dedicated Women’s Forum, a safe space for confidential discourse on matters of concern to women and girls. The Community Protection Committees represent an important platform for cross-cultural dialogue and understanding of protective norms. Of particular concern to one committee was the issue of girl’s access to education. The contents and frequency of distribution of hygiene kits to refugees, which included sanitary pads, were insufficient to meet the needs of menstruating women and girls. As a result, girls often stayed away from school thereby affecting not only the quality of their education, but also as a consequence, their life choices. The Women’s Forum of this Protection Committee recognised that this increased the risk of girls being forced into early marriage as a survival strategy. At the same time, an Oxfam income generation initiative for refugees provided training on the making of reusable sanitary towels using materials available in the nearest large market. Members of the committee sold some of the towels as part of their income generation but most reusable sanitary towels were distributed to women and girls in their community, allowing girls to attend school with dignity. Now these girls are teaching others how to make them. Women’s Forum members then went to schools (Uganda’s favourable open door policy allows refugees to attend primary school for free), actively engaging teachers and students on the benefits of a girl’s right to education. Through the committees, refugees from South Sudan are sensitised to Uganda’s legal framework on domestic violence and child marriage. Focus group discussions held with a number of Committees reported that known incidents of violence had dropped “by more than 50%” and one Committee reported that its representation had prevented the marriage of two child brides. The Oxfam engagement with Community Protection Committees shows the importance in identifying often overlooked barriers to women’s access to education- the knock on effect of having insufficient hygiene provisions and how this can eventually lead to negative coping mechanisms such as early marriage. Displacement frequently increases child marriage as a negative coping mechanism and the practice can also perpetuate other forms of GBV, often leading to a lifetime of disadvantage and deprivation for girls and women.2 Trócaire responds by focusing on women’s voice and participation, women’s education, and on women’s economic empowerment. Trócaire’s partner United, Motivation, Education and Empowerment for Development Foundation (UMEED) established women friendly spaces in Peshwar, North West Pakistan. The project provides women, including those displaced by regional conflict, with a safe space where they can get client centred emotional and psychosocial support, education to reduce the incidence of early marriage, and also opportunities for income generation activities and life skills. A female protection officer, together with social mobilisers, carries out home visits to encourage women and girls to attend these women friendly spaces. The project team explain the purpose of women friendly spaces and assure them on security, safety and other concerns. Male family members are also invited to community meetings to discuss the project’s activities. Within these spaces, women and girls meet other girls of a similar age and they discuss their concerns, whilst exchanging their skills on embroidery, cooking and stitching. The Trócaire and UMEED Foundation partnership also coordinates other service providers to arrange sessions on life skills, provide psychosocial support through different recreational activities and arrange skills training for income generation. The project is an example of working with a diverse mix of local service providers, through a local organisation, to provide girls with a range of opportunities that have been denied as a result of displacement, and the cultural norms that dominate women’s lives. Education provides a myriad of opportunities for girls, from self-confidence and social stability to earning opportunities and better health outcomes. These methods of empowering girls, by offering them opportunities to gain skills and education, providing support networks, and creating ‘safe spaces’ where they can gather and meet outside the home, can have multiple social benefits, changing norms and attitudes and helping them to assert their rights. Rabia is a 16 year old girl from Bara Agency in North West Pakistan. Her family was displaced to Peshwar as a result of military operations against non-state actors. Rabia enjoyed school but could not continue her studies after 4th grade. Belonging to the traditional Pashtun culture, she is not allowed to move freely outside of her home. Rabia was engaged to be married at the age of 12, and following the marriage, her in-laws were strictly against her continued education. A female Protection Officer visited Rabia’s home to encourage the women in her family to attend women friendly spaces. Rabia and her mother wanted to join but her father and uncle did not allow them. After the project team explained the purpose of women friendly spaces and invited Rabia’s father and uncle to a community meeting to discuss the projects activities, Rabia was allowed to attend a women friendly space. At this space, she meets other girls her age and they discuss their concerns, whilst exchanging their skills on embroidery, cooking and stitching. More than 1.6 million people are internally displaced across South Sudan, in addition to 786,000 people who have fled to neighbouring countries since December 2013.52 Most displaced children have not received any formal education since December 2013 and many have been exposed to numerous forms of violence such as recruitment by armed groups, acute physical violence and a high incidence of sexual and gender-based violence. World Vision puts a strong emphasis on working with communities to reinforce the value of women and men, girls and boys, and the significance of their contribution to their families, communities and society in all settings, including emergencies and fragile contexts, to build peaceful and sustainable societies based on gender equality. In order to do so, child well-being, education and protection is at the heart of every endeavour. In South Sudan, World Vision has been delivering a programme funded by Irish Aid which illustrates how it is possible to tackle the two main causes of GBV: gender inequality and discrimination through protection and education for internally displaced children and their respective families and communities implemented with two underlying principles: promoting gender equality and GBV prevention through education for boys, girls, women and men. Overall, the programme believes in and promotes the idea that IDPs, particularly women and girls, are the active and effective agents of change capable of contributing towards the betterment of the community they live in. Education and Protection programmes that promote gender equality, protection and prevention of GBV at their core are vital for helping women and girls in fragile communities unlock their potential in creating sustainable and peaceful environments. The formation of girls clubs in March 2016, aimed at empowering women with a greater knowledge of gender equality, GBV, protection, and the importance of education. The recruitment and training of both male and female teachers and volunteers from within the community, to ensure robust engagement of men and boys. Close partnership between the NGOs in the field, at local, regional, national and international levels, which led to a Protection Working Group focused on child protection and GBV. Capacity building training for staff, volunteers, women’s groups and parents associations, around child protection, GBV, gender equality, girl’s education and early marriage to create a protective environment for all children carried out by all the different members of the community. The involvement of religious leaders to be agents of social change. Though religious leaders were not targeted directly in this particular programme, the World Vision team recognised their roles as valuable members of the community and they were engaged through members of parent teacher associations. They actively worked to disseminate messages on child marriage and the importance of girls’ education during Sunday Church services. Teressa, is 24 years old and has been displaced twice in her life as a result of conflict in South Sudan. When she first entered the camp in Melut county, she didn’t see many opportunities for education and thought that there was widespread gender inequality at the camp, with most men spending their days idle while women were responsibility for collecting firewood, cooking, cleaning and looking after children. In August 2015, she applied to be a teacher at the Irish Aid supported education project and started working as a volunteer assistant teacher. After three months, she became a teacher in one of the Early Child Development centres. 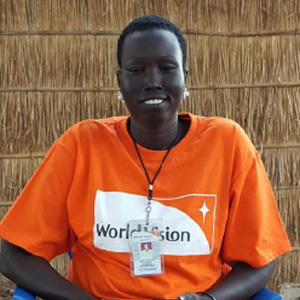 Since April 2016, Teressa has been working with World Vision South Sudan as a Food Monitor and is now happy to be working in the area of nutrition and supporting her son.